short girl, long island. : Giveaway, Day 17: Moonlit Glass Jewelry. CLOSED. Welcome back to the workweek. Hopefully you all spent your weekend with those that make your life magical. Today's giveaway is from Ailea, over at Moonlit Glass Jewelry. 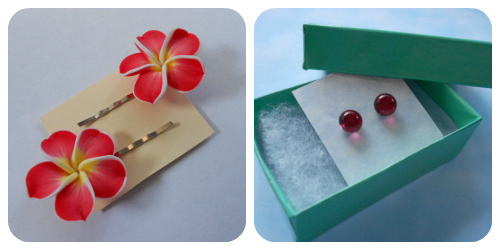 She graciously donated a pair of Red Plumeria Bobby Pins + a pair of Raspberry Red Dichroic Glass Studs, which are great ways to add a pop of color to your outfits! Ailea + her husband also have another Etsy shop, where they sell fun stickers for your car or laptop [they welcome custom orders, too], so make sure to swing by - these make great stocking stuffers! Note: All giveaway entries are checked, so if you do not do the task + say you did, that entry is disqualified. There have been many people who have been cheating, which is pretty sad. This is supposed to be fun, so be honest, please! I love the nuts & washers earrings. It would be like carrying my father around with me...in a cute way! I love T-Rex earrings! I like brass jewellery and I find them so much fun! The Vintage German Glass Emerald Green Blue Cameo Necklace Is sooooo pretty!